New York City Iron Works / J. M. Duclos & Co. In 1881 the American Architect & Building News (22 Oct. 1881, p. ix) reported, "One Hundred and Fourth St., n s, 150' w Ave. A, 2 one-st'y brick foundry & machine shops; cost $5000 & $7000, owner Francis H Duclos, New Brunswick, NJ; architect G B Billerwell." This was to be the home of the New York City Iron Works, aka J. M. Duclos & Co. J. M. Duclos was Joseph M. Duclos, and Francis H. Duclos (named as owner) was Joseph Duclos's wife. Joseph M. Duclos (ca.1831-1913) was born in France, immigrated to the U. S. in 1854, and became a naturalized citizen 17 Oct. 1867. He is listed in New York city directories as an architect from 1858 through 1874, then re-surfaces in 1880 as iron founder and architect intermittently through 1898. He is found in the U. S. Census of 1870 living on East 11th St. He gave his occupation as "Iron Architect" in this census. The Official Gazette of the United States Patent Office, Vol. II, July 2 to Dec. 31, 1872, lists two patents for "Iron Structures" under his name. They are described as follows: "The cast-metal walls of iron structures are finished with panels on both sides, the object being to dispense with the usual additional interior finish." For about 20 years from the late 1870s until the late 1890s, Joseph M. Duclos lived in New Brunswick, New Jersey. The U. S. Census of 1880 records him there with his family of wife, 7 children and a nephew. By 1900 the family had returned to New York and were living on New York Ave. in Brooklyn. In this census his birth date appears as "April 1840." This date, however, would seem to be inaccurate. The following census (1910) lists him as 78 years old (i.e., born in 1831), and his death notice (New York Times, 14 Dec. 1913, p. 15) reports that he died in his 82nd year (i.e. born in 1832). The New York City Landmarks Preservation Commission Report on the Potter Building (17 Sep. 1996, p. 4) lists New York City Iron Works / J. M. Duclos & Co. as one of the companies that supplied exterior cast iron and interior structural ironwork for that building. The Potter Building, located at 35-38 Park Row near City Hall Park, was constructed 1883-1886. 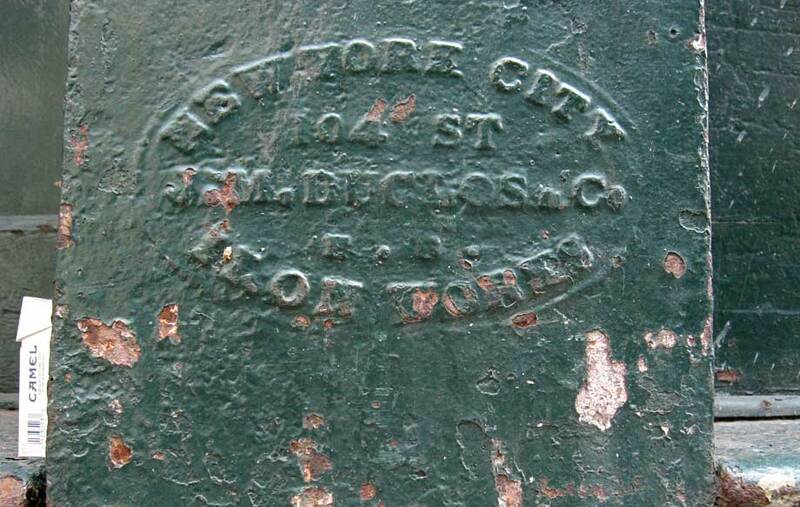 The New York City / Duclos foundry mark on the Potter Building is found on Beekman St. at the corner of Park Row. Duclos's New York City Iron Works were in business from around 1882 to 1889. Duclos himself remained an architect and iron builder, with offices in Manhattan, until around 1900, but the last listing for a foundry on the East River at the foot of E. 104th St. is in the 1889 city directory. The founder's mark above is found on the Desbrosses St. side of 441-453 Greenwich St. This building has addresses on Vestry and Desbrosses Sts. as well as Greenwich. There is another extended row of Duclos foundry marks on the buildings at 428-436 Greenwich St. A shop front here extended across three adjacent buildings. The foundry marks at 428-436 Greenwich St. seem to be identical to those at 441-453 Greenwich St. (click for image). 428-432 Greenwich St. is home to the sign for Port Warehouses (image from 1993). For the history of Port Warehouses see the Port Warehouses Page.